I have been so excited since I saw that one of the topics for this weeks' blog hop at the Stressed-Less Living study hosted by Proverbs 31 was women who have shaped us on our faith journey. While I have a few I could mention, I'd really like to introduce you to my grandmother. Grandma was born in Northern Ireland in a large family. Her parents were Salvation Army officers in various low income areas. After two of her siblings died of measles (and she spent a year in bed), they decided to look for a new environment for their children and moved to Canada. Grandma was 12. She never lost that gentle accent or that connection to "the old country." Grandma was my favourite person in the entire world other than my mother (and it would have been a close race!) I was the first granddaughter and she was a lover of all things feminine. I would go to her apartment for the weekend and there would be scented bubble baths, having my hair done in elaborate braids and I wore a skirt or dress all the time (which was the absolute opposite of my hippie mother, who only wanted me in brown bell-bottoms, which I thought was cruel and unusual punishment). A wonderful thing about Grandma was that after many decades of her life as first a minister's daughter in the prairies in the 1920's and then as a minister's wife, she had learned to live in genteel poverty in a way that made us all feel rich. She always set a lovely table, her home was always wonderfully comfortable, she was always well-turned out and most of all, she always had a warm smile, a lovely lap and she always made me feel as if I was the most important thing in her world. She also did the most wonderful knitting and I am sure that I am a knitter because of those few early lessons that she gave me. There were several things about Grandma that I have really carried with me as good life lessons and while I don't always accomplish them, I do my best. She lived her faith in each stage of her life and she planted that in each of us. 1. Always being gracious and showing kindness to those around you. Grandma may have had a few quirks (which I learned about later, as I child, I only knew how amazing she was) she would NEVER be rude to anyone, ever (and it most certainly would NEVER have been tolerated in any of us). She treated everyone the same way, whether a rich congregation member or a street person. 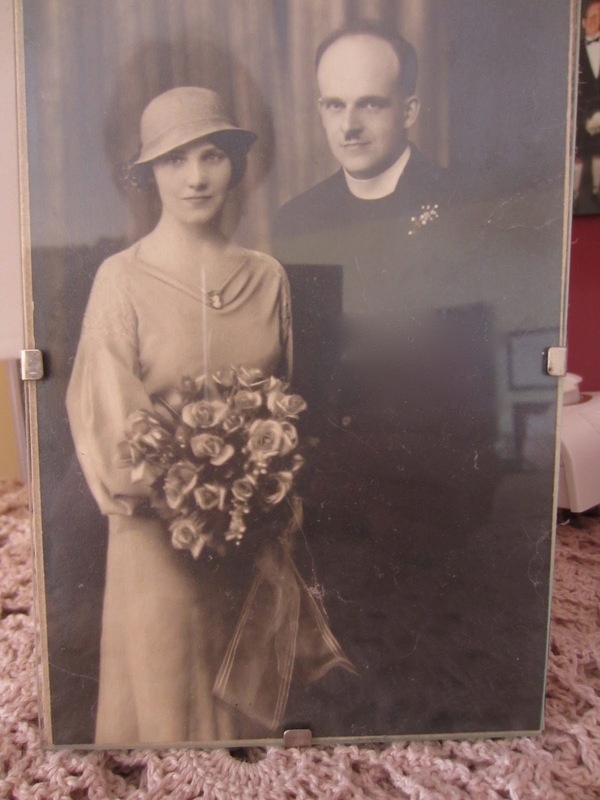 Before her marriage, she worked on the docks in Montreal helping new arrivals to Canada and between that and her parents helping the poor men getting off the trains in the prairies during the Depression, she learned that every person is precious and that part of her calling was to be blessing to those around her. I still remember that she always had Life Savers for the local street kids that came to our church on Sunday mornings and if she wasn't in the choir, she would have them sit with her. 2. Family is a gift and should never be taken for granted. Grandma most certainly taught me lessons about unconditional love. Family was the essence of life and came before anything else, other than God. She cherished us all and we all knew that no matter what, she would be there for us. It was a wonderful model of God's love. It gave all of us a stability that helped us to get through some of life's tougher times. 3. Live according to your faith. Her faith was most definitely not a "Sunday morning" faith, it permeated all of her life. We would sing hymns together (I still remember her singing "The Holy City" and she had a lovely voice - while it is very dated, I will always adore it), read Bible texts together and pray together. Church was the center of her life and it was not just a social experience, it was a place to go to be part of God's family. 4. Live as though you are rich. I don't mean this in the sense of having a lot or spending beyond your means, just that there are gifts in each day and we should cherish and enjoy what God has given us. Especially here in North America, we have so much and yet, we complain that we want more. Grandma was this side of destitute after Grandpa died (his church pension was next to nothing and they had never earned enough to build up any savings) and yet, because she shared so much and lived for love rather than things, one never had a sense of being poor. I am not anywhere near as grateful for everything that I have as I should be and I would love my children to have wonderful memories of a mom who created a lovely world for them, full of what is most important. Grandma died when I was 12 and, almost 30 years ago and other than mom, nobody has had the same impact on me. I am so grateful to God that I had her and I would like to try to follow her lead in how to live life as a Christian.